Project Kaisei's founders were Doug Woodring, George Orbelian and Mary Crowley, with the assistance of the renowned plastics expert Ed Kosior, currently managing director of NEXTEK, who has been developing a treatment system for ocean-based plastic wastes. This system uses no oxygen and low heat, to allow for a wide variety of plastics to be used as a diesel fuel. It can be used on a boat at sea although actual usage depends on the amount of debris that can be collected. Established to increase the understanding and the scale of marine debris, its impact on our ocean environment, and how we can introduce solutions for both prevention and clean-up. Its main focus is on the North Pacific Gyre. They are serving as a catalyst to bring public groups and private collaborators to design and test scientific breakthroughs, preventions and remediation. Project Kaisei also celebrated World Ocean Day and hosted the World’s First Combined Ocean Sports Clean Up Effort. Held on June 7th, 2009, it was a great success. Movre than 10 organizations from many diverse sports disciplines were represented in locations from Hong Kong, to Sai Kung, to Lantau and Stanley. 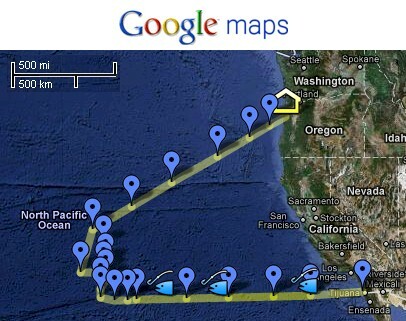 In the summer of 2010 Project Kaisei will be doing another expedition to the North Pacific Gyre to continue their research and test their newly created systems of debris collecting. Any debris that is collected will be used to study any possible uses for fuel or other usable materials. Project Kaisei is organized under the SCRIPPS Institution of Oceanography which is devoted to the preservation of Maritime Arts, Arts and Sciences, and the Ocean Environment. Seaplex is a group of doctoral students and research volunteers from the Scripps Institution of Oceanography at the University of California at San Diego. The Scripps Institution of Oceanography has one of the largest academic research fleets in the world, with four research vessels and the research platform FLIP. Since 1907, Scripps oceanographic vessels have played a critical role in the exploration of our planet, conducting important research in all the world’s oceans. Using the results of their expeditions they plan to provide crucial, and timely data providing new focus on the environmental problem to the Scripps’ long tradition of Pacific exploration. Partnering with Project Kaisei, the Scripps research vessel the New Horizon joined with Project Kaisei's iconic tall ship the Kaisei on an expedition to the North Pacific gyre from August 2-21 of 2009. Their purpose was to find out: how much plastic is accumulating, how is it distributed, and how is it affecting ocean life. On the right is a map of their route. Between the two ships they collected a variety of samples from this part of the ocean, and the samples are currently being analyzed. What was the most evident was the common occurance of small plastic debris that was found in every surface net that was used for their sampling over 3,500 miles between the 2 ships. The vast majority of the debris is tiny, hard-to-see pieces. The debris is like a thin soup, with some big pieces like nets and bottles intermixed. We did not observe an island or floating landfill. Our photos are representative of what we saw - larger pieces floating by every minute or so, with the space between filled up with tiny, nearly microscopic bits. Our work is just beginning - we collected lots of samples that need to be processed in the lab. We will publish our results in the peer-reviewed scientific literature, but it will take at least six months. Since most of the plastic is the same size as the marine life (less than 1/4"), it will be quite a challenge to clean it up without killing a lot of animals. Our collaborators, Project Kaisei, are exploring the possibilities. Basic research, like the kind done on the SEAPLEX voyage, is critical to understanding how to approach this – you can't clean something up if you don’t know where it is, how big it is, and what the collateral damage will be. Seaplex was supported by US Ship Funds, Project Kaisei and the National Science Foundation. Oceana, founded in 2001, is the largest international organization focused on ocean conservation. Oceana currently spans across North America, Central America, South America and Europe. Their activities take place through direct, strategic, campaigns in the effort to return the waters to their former level of abundance. Their team not only consists of scientists, but also lawyers and advocates to help retrieve results that are actually tangible. In the past ten years, this organization has been the reason for more than 70 concrete policies throughout the world's countries. 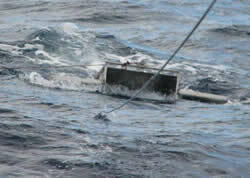 In 2009, Oceana held their annual teleconference on November 19th, 2009 at 2:30 pm EST. Their newest campaign includes global climate change and the protection of the oceans from acidification. The Algalita Marine Research Foundation (AMRF) is a non-profit independent research foundation based in Long Beach, California. They focus strongly on the protection of marine environments and their watersheds by researching the impact of plastic pollution and then providing this information to the public, private, and scientific communities. Captin Charles Moore is their founder and research coordinator. 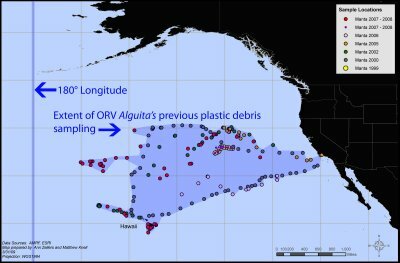 Since 1999, Algalita's research has focused on the plastic debris in the North Pacific Sub-Tropical Gyre. During 2010, they are organizing an expedition to begin studying plastic pollution in the South Atlantic gyre. They have developed a small device, called a manta trawl, that they carry on the back of a boat which skims across the top of the water while traveling through the ocean. This device is just for samples to test the different kinds of plastics in the ocean so they can later find out an efficient way to effectively get every last bit of the debris out of the ocean. Right now they are only in the very beginning of their research stage. A second method of collection is called a Bongo Net, having a mesh of 333 microns, which vertically samples waters from a depth of up to 100 meters. In every sample that they have procured they have found plastic debris. They offer many opportunities for cooperation with educational facilities to help them better understand the issue of debris in the oceans. Some of these programs include Plastics Are Forever, Watershed Outreach, and Ship-to-Store. They also have many public programs including JunkRide 2009, JunkRaft 2009, ORV Alguita blog, Event Tabling, and the Speaker Bureau. Algalita has a multitude of different research and restoration projects currently in progress. One of the main restoration projects is to restore the kelp forests along the California coastline. They also map plastic pollution, study the biological impact of pollutants, have annual Pacific Explorations, take North Pacific Gyre Plankton Samples, a S.E.A. lab, and Pelagic Plastics. Moore is a Captain from Long Beach , California. His father was an industrial chemist and sailor. He attended the University of California at San Diego, majoring in Chemistry and Spanish. He founded Algalita in 1994 after 25 years of running a woodworking and finishing business. In 1995 he launched Alguita in Tasmania. 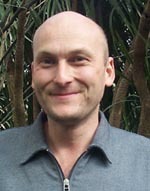 He organized the Australian Government's first "Coastcare" research voyage to document the anthropogenic contamination of Australia's east coast. When he came back to California he was named a coordinator of the State Water Resources Control Board's Volunteer Water Monitoring Steering Committee. While working with the "Surfrider Foundation", he developed chemical and bacterial monitoring methods. In 1999 he conducted a study that stated that there were 6 times more plastic fragments by weight in the central Pacific than zoo plankton. He later found out that plastic outweighs plankton by a factor of 2.5 in the surface waters of Southern California. Captain Moore has now conducted numerous voyages on which he has covered over twenty thousand miles of the north Pacific ocean, across 22 degrees of latitude and 50 degrees of longitude. On his most recent voyage to the Great Garbage Ring he states that it's too dangerous to continue to go out on these voyages because the plastic was such a problem that it was harming the propellers. Richard Thompson, a professor and Reader in Marine Benthic Ecology at Plymouth University in England, is a marine biologist/ecologist studying the effects of microplastic on marine animals. He is a member of the Marine Biological Society and the British Ecological Society and serves on many different panels. He is a reviewer of research grants for the Natural Environment Research Council, UK, National Science Foundation, USA, and the Science Foundation, Ireland. His research on the effects of plastic in the marine environment has been a working project for the past decade. Some of Dr. Thompson's research is based on the toxins that plastics may absorb. His research tentatively concludes that plastics may absorb hydrophobic organic toxins such as PCBs (polychlorinated biphenyls). When plastic does absorb these toxins its generally in unusually high concentrations, somewhere in the ballpark of 100,000-1,000,000 times the concentrations in just regular non-toxic seawater. His research also comes to the conclusion that these plastics may even desorb, or give off, the concentrations of toxins to biological creatures that digest them. There's one more problem; the bottom feeders, or the creatures that eat the stuff on the benthic layer (garbage, plastic, etc...) may also be caused harm by these toxic carrying pieces of microplastic. Generally what happens is the plastic will give off its toxins and then the sediment on the bottom floor will then absorb said toxins. From there, the benthic-feeding fishies eat the toxic dirt and will, most likely, perish. These hydrophobic organic toxins come from pesticides and other manmade things. More or less, the toxins come from other toxins. It has been found that these toxins are endocrine disrupters. Or on a more humorous note "gender benders." They interfere with the reproduction processes, developmental processes, and immune systems of animals. They're called gender benders because the toxins found in plastics have been linked to the masculinization of female polar bears, egg development in male flatfish, and random abortions from seals. 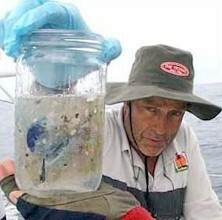 Richard Thompson has not only done research on the effects of plastic on the marine environment, but also their sources. Along the beaches he works to clean-up and research in Plymouth, just a handful of sand contains 20% plastic with more than 30 little bits of plastic called nurdles. These nurdles are what different plastic products are made of. So obviously, they're from some factory or cargo boat. The problem with this however, is that there are no factories or cargo harbors near the stretch of Plymouth beach he was inspecting. Again, where did it all come from? The simple answer to that is it comes from everywhere. The tide sweeps the plastic in and out, and if it gets in the Gyre currents, it becomes a part of the inane amounts of plastic in middle of the Atlantic Ocean. There are similar problems to this all around the world, the Pacific Ocean is the most prominent, but the Gyre currents around the world have trash swirling around in them. Richard Thompson and his graduate students studied plankton samples over a 40 year period. Because of the way the plankton was collected for sampling, plastic was also gathered. They studied the amount of plastic involved with the plankton samples and found that from 1960 to 1990 that the amount of plastic in the samples tripled. Their studies were to try and figure out the longevity of plastic, and because we have only been producing plastic for some odd 40-50 years, and the amount of plastic in our oceans has only gotten larger, it's hard to accuratly estimate the time it will take for a single plastic bottle to break down and dissapear. It is also well documented that over a million sea birds globally and 100,000 mammals and sea turtles die every year due to plastic. Whether it be ingestion of toxic plastic or just simple entanglement, animal life is being destroyed. The mass of plastic floating around in our ocean is immense. A tidbit of data found by the Algalita Research Foundation states that "in the pacific, there are six times the amount of plastic than resident plankton."